"Sampath Speaking" - the thoughts of an Insurer from Thiruvallikkeni: hot summer ~ thirsty animals ~ and leopard has its head struck !! hot summer ~ thirsty animals ~ and leopard has its head struck !! A female leopard and two cubs were spotted by villagers of Sahrawan village, Manesar — 20 kilometres from Rajiv Chowkin Gurgaon — on Tuesday morning, reports HT. Villagers claim that the leopard was seen around 5am near a tube well in the village. A woman first spotted the leopard and she informed other villagers and the police. The leopard (Pantherapardus) is one of the five "big cats" in the genus Panthera. It is a member of the familyFelidae; compared to other members of Felidae, the leopard has relatively short legs and a long body with a large skull. It is similar in appearance to the jaguar, but is smaller and more lightly built. Leopards are graceful and powerful big cats closely related to lions, tigers, and jaguars. The leopard is so strong and comfortable in trees that it often hauls its kills into the branches. I had recently posted on the leopard visit to a school in Bengaluru prompting holidays to 100s of schools in the vicinity. The animal entering the school premises created such a scare that schools in the vicinity were closed. The leopard, played hide and seek with the forest officials team and a huge number of villagers who were camping on adjacent buildings and tree tops, cut loose during the final stages of the operation to nab it as it attacked a wildlife expert, leaving bleeding injuries on him. The captured leopard was taken to Bannerghatta National Park for medical treatment, later broke out of its cage. Various versions were circulating on its probable escape – one said the leopard escaped when attendants opened the cage to feed it, possibly when the cage door was not properly shut; the other revealed that the 45 kilogram feline squeezed out of the narrow bars of the iron cage which was probably one meant for Tiger – the leopard did what no other feline in the 16-year-old rescue centre did — break free. Another report detailed its agility – stating that in the main enclosure, the gate to a smaller treatment cage is controlled by a counter-weight. The leopard managed to reach out to the rope holding the counter-weight and pull it down. This opens the trap door, if only slightly, and it made its way to the treatment cage. The cage is surrounded on three sides with vertical grills. The roof has a metal mesh with six-inch square openings. The feline managed to squeeze through this and then spring out into the ‘kraal enclosure’. From here, the tall trees allowed the agile animal to hop over the 20-feet barbed wire and electrified fence into the open.The officials capped it stating that there was no room for alarm, as it had only entered its natural habitat !! 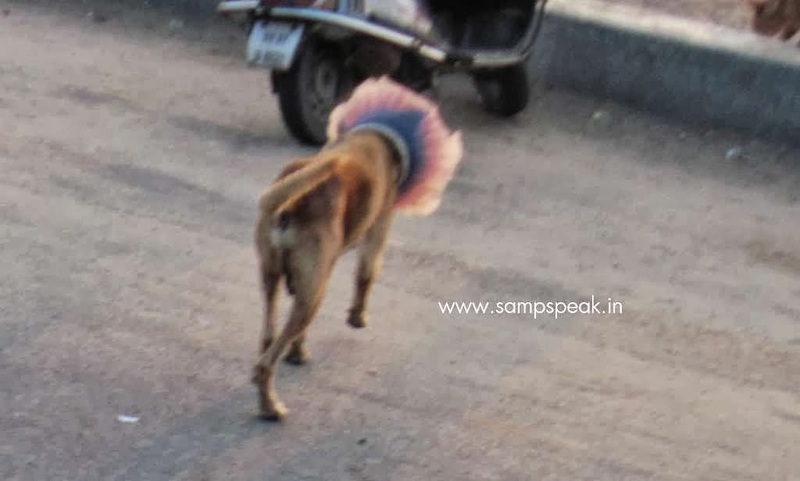 A couple of years ago, I had posted on a poor mongrel at Marina beach – that seemingly had the mane of a Lion ~ nowhere close to majestic - that of an old used plastic pot……….the dog had put its head into the pot – perhaps trying to drink water and had its head struck…… some good Samaritan did the cutting job to the best of his ability – the dog could breathe, see and run normally – not sure how much the mane constrained its eating and other activities. Dogs are family of Canidae and perhaps has no relationship with Felidae, the family of cats. Cats are obligate carnivores; they must consume meat to survive. Whichever families they are, all animals become thirsty and roam in search of water… and one such search landed the leopard in a bad situation in Oct 2015 in Rajasthan. Considered among the stealthiest and fastest animals in the world, this leopard found itself in a not-so-graceful spot in Rajasthan. 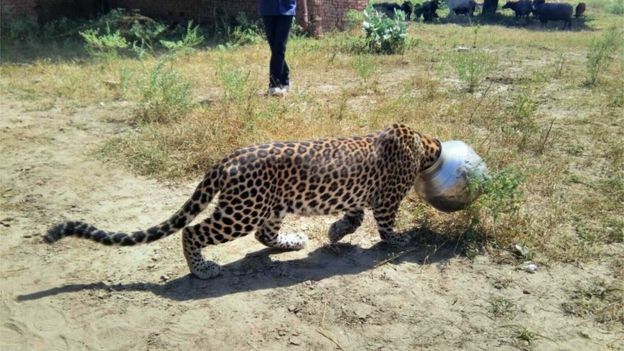 In search of water, the leopard got its head stuck in an utensil atRajsamand district's Sadulkhera village. Locals stated that the leopard probably strayed into the village from the neighbouringKumbhalgarh sanctuary. 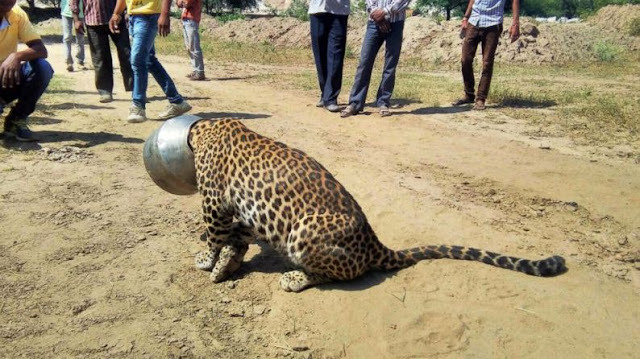 Even as the leopard struggled to wriggle its head out of the utensil, people gathered around the creature trying to take pictures and record video.The unfortunate creature was finally rescued by forest officials who tranquillized it and then managed to take the pot off his head. After having its head struck for 5 hours and running around in panic, not able to see things, the captured leopard was kept under observation and then released in wild. A recent wildlife census estimates that India has a leopard population of between 12,000 and 14,000 animals.